When I started in medicine all resuscitation started with some form of supplemental oxygen. 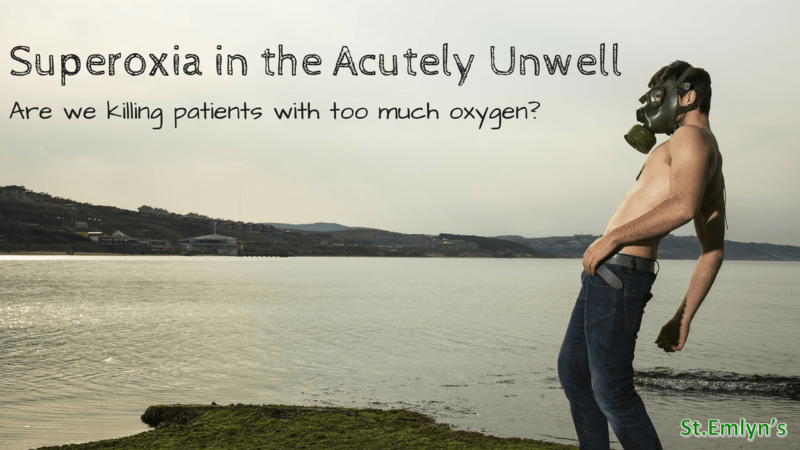 Whether that was by face mask, LMA or intubation, oxygen was the mainstay of initial treatment and you would even fail exams for not suggesting it for everyone. In some cases I wondered if I should have my own personal O2 supply during a resuscitation as it would seem to be the treatment for everyone and everything and if good for patients, then perhaps it would be great for me too? Over the years that enthusiasm for universal supplemental oxygen has waned. I think I first started to think about this when we published BestBets that suggested supplemental oxygen in stroke and cardiac patients had little benefit1,2. Since then we have seen practice changes around the use of O2 in stroke and acute coronary syndromes and in Virchester the practice for these patients is to keep SaO2 levels within the normal range, and not to try and achieve supra-normal levels of oxygenation. However, controversies still remain across a range of conditions where we don’t really know what best practice is. Back in 2003/2004 the evidence was weak at best and so it’s great to see a recent meta-analysis on the topic published in the Lancet3. The abstract is below, but as always we strongly recommend you read the full paper and make up your own mind about the results. There is also an excellent editorial which you should also read4. It’s a systematic review and meta-analysis. This is considered a high methodological approach to research (surpassed only by the n of 1 trial) but just becausae someone has applied a method it does not automatically mean that it has been done well. All studies need critical appraisal irrespective of the chosen methodology. In this paper the authors have used fairly standard approaches to conduct their meta-analysis with careful statistical approaches to ensure that the data are combined in a sensible way. In a systematic review we can think of the included papers as the subjects/patients/raw data. We want to know that the authors have found all the relevant articles, we want to know about their quality and we want to know whether they can be usefully combined into a single message. In this study the search is pretty extensive using multiple databases, all languages (often SRs exclude non-English papers), reference screening and direct contact with researchers noted in the field. In essence it looks like a comprehensive search approach and it’s unlikely that they will have missed any highly important papers. There are some quite important exclusions, this is only in adults >18 and many chronic diseases and special cases are excluded. The definition of acute illness is also quite broad ranging from appendicitis to Cardiac Arrest. That’s a really important question for us in interpretation as the inclusion of such a broad range of illnesses may fail to recognise significant harm or benefit in specific pathologies. For example, there are few if any trauma patients in these studies. Overall they included 26 studies, 25 of which were RCTs and included in the meta-analysis. These studies included over 16000 patients. What were they really looking at? In terms of intervention the authors included RCTs that compared liberal oxygen use against conservative oxgen use in critically ill adults. There is some variation in what is meant by liberal and conservative between studies, but in general liberal is a tolerance of SaO2 >92-96%. What were the main results? The principle result is the effect on mortality. In these studies the conservative oxygen strategy was better than a liberal oxygen strategy for in-hospital mortality at (relative risk 1·21, 95% CI 1·03–1·43, I²=0%, high quality). The same was true at 30 days (RR 1·14, 95% CI 1·01–1·29, I²=0%, high quality) and at longest follow up (RR 1·14, 95% CI 1·01–1·29, I²=0%, high quality), and at longest follow-up (RR 1·10, 95% CI 1·00–1·20, I²=0%, highquality). Morbidity outcomes were similar between groups. The authors also tested the robustness of the findings using sequential, subgroup, and sensitivity analyses and found no change to the overall message. It’s also worth noting that the overall result is consistent across nearly all the trials, so it’s not as if there was one mega-trial that swayed the results. The effect does seem to be consistent across the various different types of acute illness (mostly stroke, cardiac, critical care). This again supports the hypothesis that O2 may be harmful. So do I. I find them difficult to interpret and difficult to conceptualise back to my practice and so it’s useful to convert them back into real numbers. We can do this by estimating the true effect across the entire population. For example if we take in hospital mortality, the overall death rates were 283/7555 for liberal and 227/7516 for conservative. In percentage terms that’s 3.74% vs. 3.02%. Now we see that the difference, although there, is not so great. Expressed as a number needed to treat (NNT) this comes out as 138. To summarise the other outcomes as NNTs we get the following. You might think those are fairly big numbers but in truth those are fairly impressive NNTs, especially when you consider the overall burden on health economies of these types of patients. Although the NNT is moderate, the size of the populations in our practice means that this could be a very meaningful intervention across a health economy. We are talking thousands of patients a year in a country like the US. Oxygen is good for you of course. Anyone who has tried to do without it will be fully aware of the challenges of hypoxia, but what’s the problem with 02 excess? This study cannot answer that question, but the discussion explores the pathophysiological argument for why an excess of 02 may be a problem for the critically unwell. In essence we know that 02 levels are a powerful driver in physiology and pathology and we also know that were never designed or evolved to have supra-normal levels as they don’t occur in nature. Vasoconstriction, inflammation and oxiditive stress have all been demonstrated in physiological models and constitute plausible mechanisms for harm. However, the discussion is more nuanced than this and I would recommend you read the full article to understand specific sub groups (e.g. surgical patients where super-oxia may be beneficial). So what does this mean for my practice? In Virchester it means that we will carry on as we have done recently. Superoxia is to be avoided. In a small group of patients we will tolerate superoxia (for example in the initial resus phase whilst preparing for advanced airway management, but for the vast majority of our patients an Sa02 of >94% is just fine thanks. Oxygen in Myocardial Infarction. BestBets. https://bestbets.org/bets/bet.php?id=645. Published 2004. Accessed May 13, 2018. Oxygen in stroke. BestBets. https://bestbets.org/database/browse-by-topic.php?CategoryID=62. Published 2003. Accessed May 13, 2018.